The only vegetable that is loved by the entire population is Potato. Any dish made with potatoes are delicious. However the taste might be, a dish with potato as its main ingredient is scrumptious. 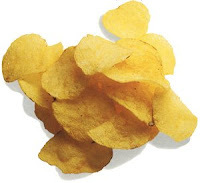 Potato chips - when we hear this, we drool. There are different flavours of potato chips, however, the basic home made potato chips recipe still has its place in our hearts unshaken. And if there is a way of eating potato chips avoiding oil... i know what you are thinking....why wait? prepare it today and enjoy! Slice the potatoes approximately 1/16-inch to 1/8 inch-thick. The measurements can vary but the main aim is the potatoes must be thin. To remove potato starch, rinse the slices in a bowl of cold water; change the water twice. Wipe the slices thoroughly with paper towels so that the moisture is removed. Sprinkle sliced potatoes with the spices mentioned above in the ingredients or just leave them plain. If you have a microwave bacon tray, place the sliced potatoes flat on the tray in a single layer. If you do not have a bacon tray, use a microwave-safe casserole dish. Rub the inside of the dish with some olive oil or spray with non-stick cooking spray. Cover with a microwaveable, round heavy plastic cover. Microwave on HIGH for 4 minutes; turn slices over and continue to microwave on high another 3 to 5 minutes. Potatoes are done when they are lightly browned (if they aren't browned, they won't get crisp). NOTE: Cooking time could vary slightly, depending on the wattage of your microwave.